2018 CAMP DATES HAVE BEEN ANNOUNCED!!! 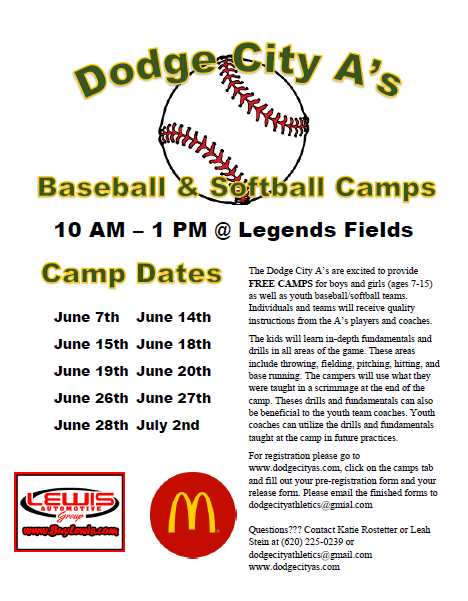 The Dodge City A's are very excited to have your children join us at our baseball and softball camps! Before your child can participate in the camps, you will need to fill out a pre-registration form and a camp wavier. Both can be found below in PDF form. When the pre-registration form and camp wavier is filled out, email the forms to dodgecityathletics@gmail.com.